128 Ohio Archaeological and Historical Quarterly. political preferment, professional honor, or social rank. that secure wealth and stimulate the progress of civilization. ing for a site upon which to locate his own western home. lying almost opposite the pretty little village of Belpre. 130 Ohio Archaeological and Historical Quarterly. from Mr. Backus, 170 acres, comprising the eastern lobe. retreat during the Indian wars. rock-studded, in some points presenting almost a palisade. willingly testify to the superb splendor of the landscape. them having had experience in the lordly homes of England. 132 Ohio Archaeological and Historical Quarterly. would smile in derision at the furore it excited in its time. appeared little less than the eighth wonder of the world. a more ideal home or more Utopian existence. of slender build, stooping shoulders, and awkward carriage. already inferred, sedentary and studious in his habits. 134 Ohio Archaeological and Historical Quarterly. what he supposed was a sure and safe seclusion. and beautiful in feature, but talented, and trained in mind. spoke and wrote fluently the Italian and French languages. with every accomplishment that can render it irresistible." 136 Ohio Archaeological and Historical Quarterly. them together and ingulf them in one common pitfall. character in this drama-for drama it is, and a sad one. of accomplishment the little Corporal of Corsica was his ideal. 138 Ohio Archaeological and Historical Quarterly. true character, and ever kept a wary eye upon his course. would have become the greatest of Napoleon's marshals. 140 Ohio Archaeological and Historical Quarterly. which tried Justice Chase for judicial irregularity. him in public confidence. His patriotism was suspected. He had sold and traded his party fealty for self advancement. obloquy, contempt and contumely of his fellow-countrymen. naught but the chilling frost. 142 Ohio Archaeological and Historical Quarterly. French, English and Spanish governments took a hand. whom we shall learn more hereafter. of the Ohio, at Louisville; or enter some land speculation. 144 Ohio Archaeological and Historical Quarterly. the river, the easy and only avenue to the point of attack? voyage was a continued series of ovations and triumphs. ing men in New Orleans who are likely to be useful to them. raising an expedition and making an incursion into Mexico. 146 Ohio Archaeological and Historical Quarterly. of Faust, and the denouement of the drama is the same. like King Richard, all aglow with the thought, "now by St.
border. Burr throws out his bait wherever there are fish. approaches Mr. Merry, British minister to the United States. traits that made her the remarkable woman she became? How he stored her mind with knowledge in polite literature? 148 Ohio Archaeological and Historical Quarterly. to figure as a minister's wife at the Court of St. James. fifteen large boats, capable of transporting five hundred men. hassett and his family, who were to accompany the fleet. residence upon the banks of the Ohio. Never was so stupendous an air castle so suddenly dissolved. 150 Ohio Archaeological and Historical Quarterly. 1Victor, "History of American Conspiracies," 295. 152 Ohio Archaeological and Historical Quarterly. river to meet the arrival of the invincible invader, Burr. Statutes, Vol. 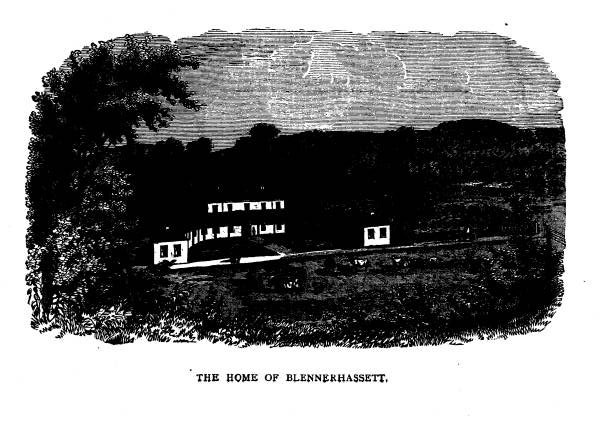 I, p. 553.
boats that had been built under Blennerhassett's direction. Wherein you 'dressed yourself? Hath it slept since? Letting I dare not wait upon I would?" 154 Ohio Archaeological and Historical Quarterly. boats to float safely by. overtook her husband on January 15th at Bayou Pierre. prodigious agitation the effort of his expedition had created. He saw his empire ending in smoke. 156 Ohio Archaeological and Historical Quarterly. Alabama, Georgia and the Carolinas, to Richmond and jail. sippi, were left to shift for themselves as best they could. famous trial of Warren Hastings in the halls of Westminster. Of this episode pen pictures have been drawn time and again. character in the country, now a criminal at the highest court. 158 Ohio Archaeological and Historical Quarterly. flowers of enchanted women and the favors of admiring men. but no evidence of overt acts. made to drink his cup to the bitter dregs. was undoubtedly deceived by his suavity and sophistry. its government; the temperament or sentiment of its people. which he deliberately ran all risk. On his return to his family he stopped at his island home. He had left it just a year before in all its superb splendor. 160 Ohio Archaeological and Historical Quarterly. existence trying to teach, write and clerk. speedy termination of my sorrows." her husband, and the only attendants at her obscure funeral. 162 Ohio Archaeological and Historical Quarterly. in a barren garret, without carpet, bed covers or even pillows. That peace could shed, or youthful fancy know. Oh, why dear isle, art thou not still my own? Thy charms could then for all my grief atone. In every native charm, by culture dress'd. Over that isle, with their destroying blast. Thy hallow'd haunts it watered as a slave. On that devoted isle let man remain. The joyful coloring of thy prime array. With thee their sweets, their bitterness forgot. That once found food and shelter of my hand. Mock jurisdiction held around my hearth. That wrought destruction taste must ever mourn. To those that arm'd the plunder-greedy crew. To blot the beauty of mild nature's reign. His work by ruffians rendered doubly waste."